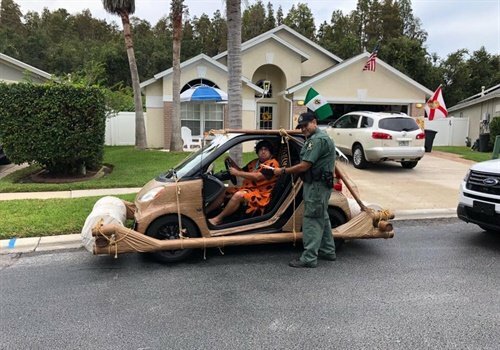 Deputies with the Pasco County (FL) Sheriff's Office pulled over a car modified to look like the vehicle driven by the cartoon character Fred Flintstone. Image courtesy of Pasco SO / Facebook. Deputies with the Pasco County (FL) Sheriff's Office pulled over a car modified to look like the vehicle driven by the cartoon character Fred Flintstone. The agency posted pictures of the traffic stop to Facebook, which quickly went viral. "Mr. Flinstone was issued a citation for speed and became unruly and had to be detained. After further investigation, Mr. Flinstone was issued a Notice To Appear and released," the agency said.